Some numbers run and the scale of hardness updated for the final two rounds. We'll discuss more on the podcast… but simply, Suns/Blues easiest with Dogs/Dockers/Saints nipping on heels. Into the next round for finals and need help with a trade. Trade Rockliff out (who my opponent has) and trade in Macrae. Help would be appreciated. Im thinking of swapping out Sidey to Oliver. I’d probably lean towards second option due to fact that macrae has carlton next round and sidey still has the ability to go big on his day in comparison to rocky on current form, especially with rocky having not the greatest TOG. 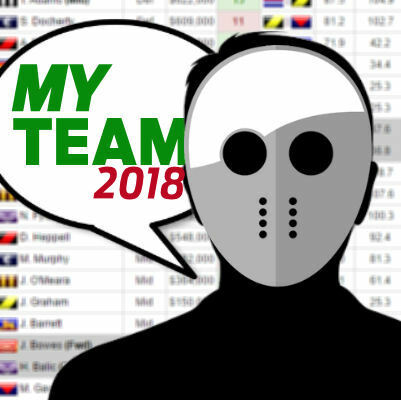 GF this week for my league.. going to get rid of Neale and can bring in anyone.. likely to be out of Cripps Oliver or Matt Crouch..
Matt Crouch has the Roos at home..
Or another option? Don’t have Kelly but might get the Sydney tag which also worries me..
Got 288k up my sleeve and will be upgrading e.curnow and phillips out of midfield. Do people think I should upgrade one of them to cripps/oliver and then the other to someone like duncan, pendlebury selwood. don’t go for one of those top two guys and chase two POD’s such as out of Ablett, Beams, Ross even. If you want a real outside the box bet, Brodie Smith is back and pumped out a ton this week. Mid $500k and could be a real POD pick for a rankings move. Hey, want to trade out Hurn, but don’t know who to bring in. Phillips –> Beams and Parker –> Cogs good trades? Can’t afford the big dogs in Oliver or Cripps. 14K in bank. Who do I swap in/out to try and maximise my points scored this week? Anyone rate Brodie Smith? The mail was that he worked really hard in rehab and has hit the ground running in his second game back on the weekend with 101. Only $539K and .5% ownership! Has North at home this week and Carlton away for the GF. I’m giving serious consideration given the lack of D6 options at the moment. Hmmmm that’s interesting! I’m scratching my head for a D6 too. Is he riskier than crisp at $535k who has a L3 average of 93? Matt Crouch is pretty consistent and his run home is pretty good with North and Carlton. 2,409 Euman Tigers and first time my main team has beaten my 2 alt teams all year. Won so through to next final, had already won draft final week before so week off so through there too. thoughts on bringing in seb ross for one of gibbs or sidebottom? Can Ablett bye trusted to replace Kelly, if Kelly is out? I brought hm in last week, but I did so bearing in mind that he plays the dockers this week with a terrible 3 game average against them. Having said that, werent his last 3 as a suns player? and now a top 8 position on the line, he should fire up?? Thanks Loki. I’ll think about it closer to the time. Hopefully, Kelly will play. Best defender to bring in under 600k? Tom McDonald, I guess, but I’ve been getting good 70s from Lienert as a fill-in. He’s only 341,000. Thanks Andy. Already playing Lienert at D6 but was looking at options to upgrade him as he is my last rookie. Shaw looks like a definite out, so likely to Brayshaw and Hogan (if doesn’t get up) to Heeney. Any other thoughts? Speaking of which, who to trade for Brayshaw: Simpson or Lienert? Simpson seems to be slowing down and hasn’t been scoring more than Lienert anyway. Also, my opponent has Lienert. and sean darcy or matthew lobbe? Field Shuey & Darcy. Lobbe might be affected by Casboult sharing ruck duties. Bit stuck on trades could go Kelly to Gaz if he’s out and Smith down to Paton. Thoughts? Neither goes. Both will be offensively good I’m the last two games. Both will average 120. Look elsewhere for changes. Gawn is banged up get Goldstein. You have just received the best advice in the history of this site. You’re welcome friend. Gawn (looked sore) to grundy? If Kelly gets named this week should I trade him anyway? Worried that the concussion would affect his form. Yes trade. Concussed players have been avg on return from concussion and Kelly playing Swans who aren’t his favourite team to play. Gawn (looked sore) to grundy?? Macrae or Ablett in this week?